Students of any age can play a role in this awesome community sustainability initiative. Even if you aren't hosting a site for the annual Pumpkin Smash you can still be involved! 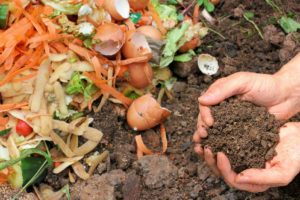 Join SCARCE to learn all about starting a compost program at school or home. Indoors or out, small or large, classroom or lunchroom, get your questions answered so you can get started! Old buses burn much dirtier then newer ones - emitting harmful toxins into the air. The EPA offers up to $6,0000 for retrofits and up to $20,000 for replacement vehicles. In this brief movie, your elementary students will learn with Isaac and James about how they have an impact - and how to make it a positive one. Even in the Midwest, all storm drains lead to a river, and eventually, the ocean. Check out renewable energy in your community! Learn all about solar energy directly from homeowners and building operators during this free open house, locations across Illinois. 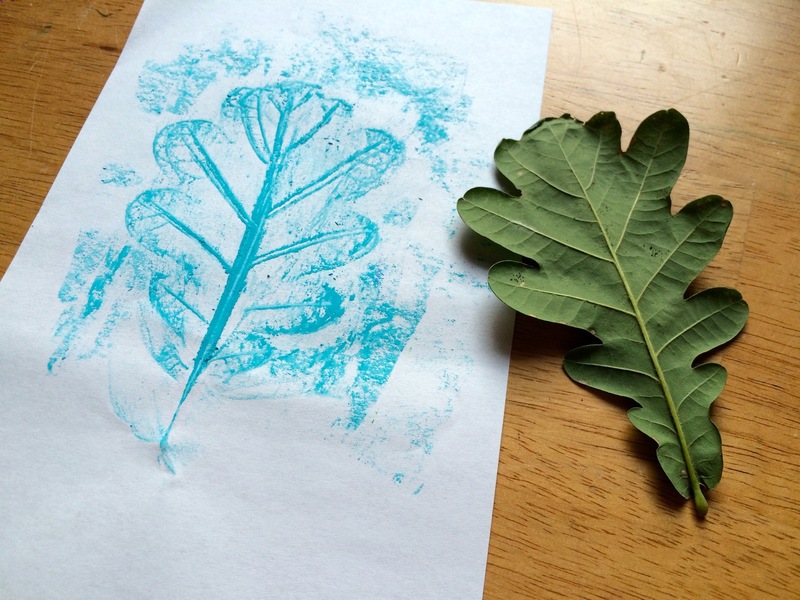 Teachers - assemble your own hands-on tool to teach your students about our natural resources. Best suited for K-5th grade teachers. Registration opens in September. 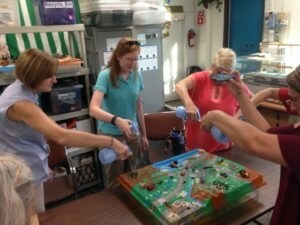 Learn about the human impact on water quality with this hands-on workshop. You'll get certified to borrow the Enviroscape Watershed Model - an interactive learning tool for your classroom. Perfect for 3rd grade-high school. Registration opens in September! Check out this month's local leaders in green! A Villa Park school district cuts waste by installing new water stations. The CDC's "Choose Safe Places for Early Care and Education" initiative aims to prevent childhood exposure to chemicals by ensuring facilities are in the safest locations to start. Connect with others concerned about protecting local waterways. 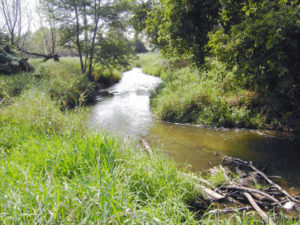 Plus, learn about streambank stabilization projects and how to fund them. Registration required. Win a Field Trip to Shedd in Wreath-Cycled Classroom Challenge - deadline coming up! The Shedd challenges your class to make a 100% recycled and recyclable wreath as part of "Wreaths to Save the Sea". They've got NGSS/CCSS aligned lessons to integrate it into your classroom. Pick up your wreath frame by October 22nd. Keep America Beautiful challenges schools to recycle their way to America Recycles Day on November 15th. The One Earth Young Filmmaker Contest seeks students passionate about filmmaking and the environment to submit short films. Entries are currently being accepted and are due by Jan 14th. Watch the clip below to learn more. The POPS Summit brings together students taking action to reduce plastic waste in their communities. They learn about current research and collaborate with peers and mentors to get inspired to take their efforts to the next level. Teams of 2-4 students ages 11-18 may apply. Summit takes place February 9-11, 2018. More details on applying here. 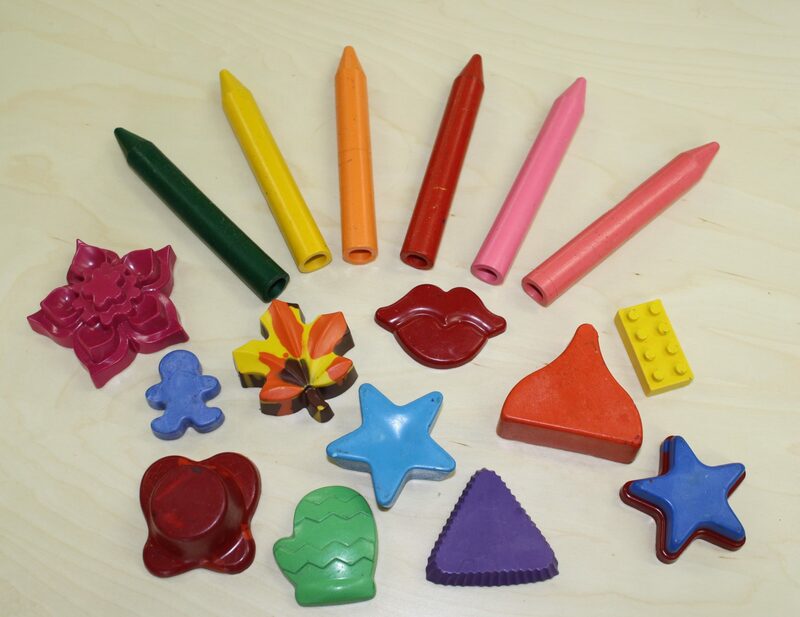 If crayola's new color has put crayons on your brain - give us a call to schedule your high school group to make Super Crayons at SCARCE. Let us help with your collection! 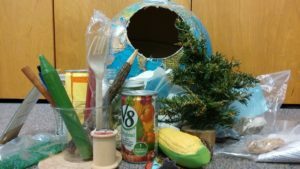 Is your school or eco-club running a collection of items for reuse or recycling? We want to help! Contact us at SCARCE and we may be able to help add to your collection efforts. The Eco-Club at York High School in Elmhurst wants your used gift cards. Cards can be donated to SCARCE. They will be upcycled into guitar picks for students at York. Oct 9 Columbus Day: Book Rescue is Open! Thank you to our September Volunteers! Geneva Varsity Dance Team members help at the Green Fair.